Brainwashed - Murderous Vision, "Voided Landscapes"; "Darkness Descends"
Murderous Vision, "Voided Landscapes"; "Darkness Descends"
As Murderous Vision, Ohio's Stephen Petrus has been one of the pioneers in the US death industrial/power electronics scene for over two decades now. It is a stylistic variation that has largely managed to avoid many of the pitfalls of its European counterpart ("provocative" political ambiguity, rampant misogyny, etc.) but retained the more creative, occasionally occult-tinged, depressive darkness. On Voided Landscapes, he continues this trend with a bit more environmental influence, both overt and subtle. 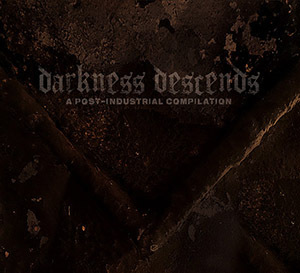 Darkness Descends is a compilation for a festival Petrus curated this past summer in Cleveland and, while produced for the festival itself, stands strongly apart as a compilation of artists that have defined the style. It is hinted at in the title, but one of the defining features of Voided Landscapes is the way Petrus captures the sense of not just urban decay, but its impact on the surrounding rural areas of Cleveland. Deep in the Rust Belt of the United States, the sound of industrial rot and polluted nature seeps into all nine of these songs. This is not new territory for Petrus: his 2010 film City/Ruins covered this topic, as well as the local artists inspired by their surroundings. Here it is very apparent though: right from the low end rumble and bleak piano sounds of "Purity Burns" there is a sense of spacious darkness and even what sounds like field recordings of ducks takes on a dour vibe. The grinding noise that opens "Voided" sets the stage for a similar piece, which soon becomes a clattering space within a swampy, oppressive sense of ambience that is just oozing with despair. There is variation throughout the album of course, but the bleakness is largely unrelenting. "Corrosive Materials" continues from the aforementioned "Voided" and concludes the disc, but adds in a bit of snappy rhythms and distortion to give an added dimension. "Moss and Bones" and "Concussion" also feature Petrus working with more rhythmic elements, mostly within a framework of treated loops and noise, however. Speaking of noise, it is never far in these nine songs. "Radiate" is pure vintage power electronics, with swirling distortion, squelching electronics, and a harsh vocal performance from Petrus that is processed into oblivion. "Sifting Ash' is similarly distorted, but less aggressive. Built upon a far off synthesizer drone, loops and textures are added in to give a strong sense of texture, and even a bit of autoharp from Pauline Lombardo offsets the chaos. Darkness Descends, curated by Petrus, was intended to accompany the festival of the same name, but works on its own as a compilation of like minded friends and artists that share a similar vision, and aesthetic. Murderous Vision opens the set with a wonderfully rhythmic piece, littered with prominent samples, metallic banging, and overdriven voices. Gnawed's "The Harrowing Dark" and The Vomit Arsonist's "Dispirited" fit in quite well, with both artists presenting massive, foundation shaking rumbles and destroyed vocal performances. "Ultimatum" from Compactor is similar in intent, but the approach is somewhat different. There is a tighter sense of structure and with its pummeling thuds and loop-heavy structure, the piece nicely builds and evolves through its dissonant textures. Theologian's "I Shed Your Corpse" is one of the high points on here, as is Steel Hook Prostheses's "Orbitoclast". The former is a pairing of melodic electronics with pounding rhythms and vocals that, while processed, end up not entirely devoid of their humanity. SHP's contribution is wobbling pseudo-melodies and dissonant noise, but shaped into a piece that is dramatic and majestic in its gloom, with an exceptional sense of depth overall. 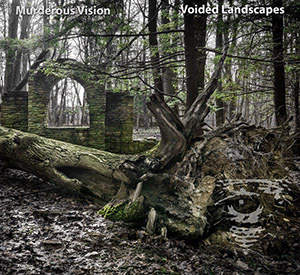 Both Stephen Petrus's newest work as Murderous Vision and his compilation project Darkness Descends may be somewhat monochromatic in their moods, but Voided Landscapes and the nine other artists who contribute to the compilation show that there are multiple shades of that brown/gray grime that covers the death industrial scene. There is a sense of depth and variation to this desperation that is perversely enjoyable, and highly recommended for anyone who likes their music dark, dissonant, but also nuanced and well developed. Gnawed - "The Harrowing Dark"
Theologian - "I Shed Your Corpse"